1. Florence. By the time she moseyed her way across Virginia on Monday she wasn't even a tropical depression anymore, but she still packed a wallop. She brought flooding rains and multiple tornadoes. 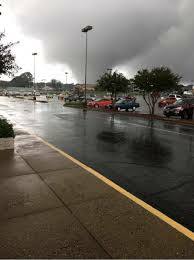 Sarah and I happened to be at Target when a tornado touched down less than a mile away. I was pretty impressed with the way Target handled the situation. They "closed" the store, as in shut down all the registers and pharmacy and had everyone, including the customers, move to the back of the store. The whole event took about three hours because we'd get the all clear signal and everyone would start making their way up front to the registers and the warning sirens would go off again and everyone would turn around and return to the back of the store. Over and over and over again. I have to say, I really was impressed with both the Target employees and their customers. No one was complaining, even the moms with small children in tow. A couple of the employees got a few simple toys off the shelves and played with some of the children to keep them occupied. Even when our ears began popping from the change in air pressure, everyone stayed nice and calm. I was amazed. 2. Speaking of Florence.... The Florence news coverage introduced me to the NC shark cam. I mentioned how obsessed I am with this underwater view the other day. But I'm embarrassed to admit that after spending two whole days wondering why there were so many sharks in that area, I finally realized I was watching a highlight reel, not live video because the cameras were damaged in the storm. I feel pretty silly for not realizing it, but dang! I'm happy to learn that there aren't that many sharks swimming off the coast of NC. .... Or are they? Guess I'll have to wait for the cameras to be repaired to find out. 3. It's funny the tricks our minds play on us. When creating my Labor Day post, I didn't even notice the grammatical error in the meme until the next day when I was looking at it before my morning coffee had kicked in. My awake brain glossed over the error and saw what it should have said while my still-asleep brain read the actual words. I find that interesting. And a little scary. Does that mean I should begin doing all my proof reading in the morning before coffee?? Yikes! That was some storm!! Glad you are safe. I like your third "thing" and am going to have to pay attention (if I can early a.m.) to how I am before and after coffee. I'm pretty sure I'm halfway in a coma stage before - lol. The idea of me having to 'work' before coffee is simply terrifying! I'm not only comatose, I'm mean. Not sure how I can be in a coma and mean at the same time but... I am! Wow. Those are some awe-some photos! I'm glad y'all were safe at Target. That sounds like quite an ordeal. . . I'm happy Target kept us safe too! gosh! one mile away is awfully too close to me. I know! A little too close for comfort. Glad you are alive and well. How scary to be so close to that tornado! Kudos to Target and the smart employee that got the toys for the kids. Me too!! :O) I really was quite impressed with the way Target handled the situation. I'm glad Target knew to respect a tornado. 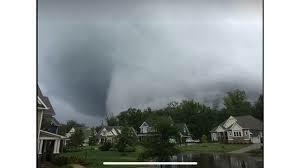 We have a few tornado sightings every year and I am always amazed that folks stand outside on decks and roofs to watch. Not me, I lived in Cheyenne, Wyo when two large tornadoes criss-crossed the city and did a great deal of damage. I have always heeded warnings and headed to the basement. I'm glad you are safe. If I'd been at home, I'd have been the idiot outside on the deck watching for the funnel cloud. But I'd also have the nearby bathroom ready to duck into. (Our bathrooms are our only enclosed, windowless space. I know my behavior is wrong but.... I can't help myself.